MONTVALE, N.J., May 1, 2018 /PRNewswire/ -- Sharp Imaging and Information Company of America (SIICA), a division of Sharp Electronics Corporation (SEC), today announced the expansion of its smart signage solution that provides higher brightness and is engineered for 24/7 around-the-clock usage. 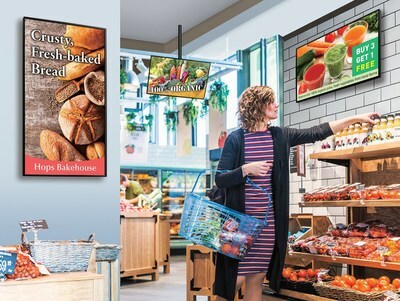 The new 40" Class (39.5" diagonal) PN-M401 and 50" Class (49.5" diagonal) PN-M501 professional LCD monitors deliver out-of-the-box digital signage solutions, even without external devices such as PCs. The PN-M displays offer mounting flexibility and can be installed in landscape or portrait orientation, face-up, face-down, tilted forward or backward at an angle of up to 90 degrees. Each PN-M series display features a powerful built-in SoC (System on a Chip) controller driven by the Arm® Cortex®-A17 quad core processor (max. 1.8 GHz) with 2 GB memory and 8 GB storage, and integrates Android™ OS for third-party Android platform apps. "The PN-M401 and PN-M501 feature excellent image quality and are designed for flexibility in a variety of settings," said Gary Bailer, director of product planning and marketing, Pro AV Products, Sharp Imaging and Information Company of America. "By creating monitors that are 50% brighter than the PN-B series, the displays allow for 24/7 usage rather than 16/7." Content can be displayed on the PN-M monitors in a number of simple ways. For example, users can display web-based digital signage content by entering a URL in the embedded HTML5 Browser and they can route videos and still images through the pre-installed media player. For more advanced applications, users can port their Android-based application to run on the PN-M Series' embedded SoC. The PN-M series utilizes the SHARP Open Architecture Platform™ for digital signage, which offers end users easy ways to download, store and play content directly from the display. This open platform is widely adopted, with 17 third-party digital signage and content management software (CMS) companies supporting the platform. Both displays offer an expansion slot compatible with the Intel® Mini Open Pluggable Specification (Mini OPS), which provides added expandability through an HDBaseT™ receiver board (PN-ZB03H) that supports various types of media and control signals, or a wireless board (PN-ZB03W) for easy wireless connection with multiple devices. An optional wireless adaptor (PN-ZW01) is also available. Designed for easy hanging installation, they can be suspended with wires from the four corners of the rear housing. The series even comes with original software for simple content distribution and SHARP e-Signage S software for professional content creation and management. The PN-M401 is now available for shipping. The PN-M501 is expected to be available for shipping in early June. **Results based on PMA Research, the large screen displays experts, U.S. Distributor Flat Panel Tracking Service report, February 2018. Results are not an endorsement of Sharp. Any reliance on these results is at the third party's own judgement and/or responsibility. Visit pmaresearch.com for more information.